Selected and Edited by Carolyn Strom Collins and Christy Woster. 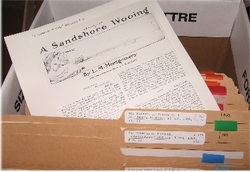 A collection of unpublished short stories was donated to The L.M. Montgomery Institute in June 2014 by Carolyn Strom Collins on behalf of the estate of Rea Wilmshurst. The collection includes photocopies of all the original magazine stories that Wilmshurst included in her published books as well as the stories she intended to publish. We will be providing more information about this donation in the 2014 issue of The Shining Scroll. You can read more about newly discovered short stories, by our researchers, and where they first appeared, on page 21 in The Shining Scroll, 2011 part 2. There was something very special about Rea, we spoke via telephone several times and of course I had no way of knowing of her serious illness. I will remember her excitement of being asked to come to Norval! My conversations with Rea are so vivid to me, I heard her voice articulate the love of Montgomery's work, all her emotions came through in her voice. Coming to a book signing for the first time meant so very much to her. We were total strangers but perhaps not, as we were both Montgomery fans, that was good enough for us. We had many conversations via telephone as Rea wanted to work out details with me about the book signing. I was totally unaware that Rea had been phoning me from her hospital bed until I arrived at the hospital with two boxes of books for her to sign. Unknown to me was how very ill Rea was and that she was on her death bed. She was so animated and happy to share stories with me that day. She signed each book with love and a special message, not just her name in each book. The copies sold with Rea's signature are a true treasure. At no time did Rea indicate what health issue she was dealing with and it was a shock for me to find her hooked up to tubes and on morphine the day I visited. She was desperate to come to Norval but with each passing day she was getting weaker but she still had hope and did not want to cancel her book signing. I did not want to give up hope, it was a very emotional day for me when Rea called to cancel the book signing. I think the emotions were attached to the realization that Rea's illness had finally taken its toll on her body. Rea would miss the last chance, perhaps she had hoped for all these years of working on Montgomery's short stories, to finally come face to face with all the Montgomery fans she had not yet had the chance to meet. Rea's summer home was on Grand Manan Island which is located in the Bay of Fundy, New Brunswick, Canada. Rea was a fan of Willa Cather - American author born in Red Cloud, Nebraska. Willa was born in 1873, and she had a summer home on Grand Manan Island too. We are admirers of Montgomery scholar, the late Rea Wilmshurst, who worked hard for years to collect, transcribe and type (! ), and publish a series of LMM's stories with McClelland & Stewart (1988-1995). She did so after obtaining permission from Dr. Stuart Macdonald, L.M. Montgomery's son. And, before that, Catherine McLay edited a collection by McGraw Hill Ryerson, The Doctor's Sweetheart (1979). More short stories were published by McGraw Hill Ryerson in The Road to Yesterday (1974), now known as The Blythes Are Quoted (2009). Nonetheless, when a reader has finished all of Montgomery's books, there is often a desire for more! LMM's short stories bring a different experience to the reader than her books do, although many of her stories were transplanted into some novels. One of the joys of reading the Wilmshurst editions is the introduction she wrote for each book. In At the Altar, she wrote: "So here are Montgomery's 'happy-ever-after' stories. Conceived by her partly to satisfy convention but also to embody her belief that she should portray the pleasanter side of life, none of them reveals the disappointments she found in her own marriage, though three of them were written after that event. Whether you live on a farm and marry the boy (or girl) next door, whether you are rich or poor, whether move to exotic climes or simply across the village, whether you are young and trembling and romantic or old and staid and prosaic, in Montgomery's hands your happiness as a bride (or groom) seems assured." We began by mentioning the "Christmas Carol" aspects of LMM's stories. 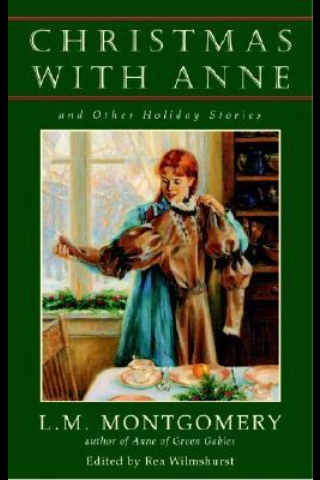 The publishers omitted one story from CHRISTMAS WITH ANNE. It was called "The Pink and Gold Heart" [read it in the Lucy Maud Montgomery Album, p. 500]. Rea was crushed when she saw it was not included because it always brought tears to her eyes. It is about a little girl who gets a pink and gold enamel heart for Christmas and she cherishes it. She overhears the adults talking about a neighbor who won't keep Christmas - she thinks that is dreadful so she gives him her pink and gold heart. He changes -- he joins the church and extends his generosity to the community. McClelland and Stewart publishers left this story out because the character used baby talk. M&S want to do another book with Anne in the title because "Anne" sells well. Rea was thinking about a Cooking With Anne book. The next book depends on what they insist. They reduced price on this one for a quick Christmas seller. She isn't sure what she will decide if they want another "skimpy" little book. LMM stories "really require more volume" - one cooking story alone was a seven-part story, serialized. Her original plan was to have the next collection focus on the village, about neighbors like the two women who live side by side, quarrel and reconcile. M&S was thinking only about two more books so she was trying for a broad theme so she could fit a lot in it. However, this Christmas book has been a "blockbuster" so M&S is considering "letting me do what I want to do." Another plan is to go farther afield - possible title AWAY FROM HOME -TALES OF BOARDING SCHOOL. Another idea is ALWAYS THE ROMANTIC TALE. There are only 10 or 12 with a western theme. One is "How We Went to the Wedding" in AGAINST THE ODDS. She would also like to try a children's theme - that is, Children's Stories, under age 10 -- there's not that much "baby talk" in them. Rea was given Anne by her mother when she was 11. She started to read it but thought Mrs. Lynde was boring. A true confession! So, her mother opened the book to the "A Tempest in the School Teapot" chapter. Rea read the book from there to the end and then started back at the beginning. After that, she read everything. I phoned her in the hospital where she is recovering from surgery to correct complications from her first round of chemotherapy last year. In her partner's words, she has been "swatted down" by the return of the cancer and surgery but loves all the good wishes from kindred spirits. She wants to recover well enough to finish the publication of these stories and go to the Symposium on PEI next year  (while she was in the hospital last year, she thought of eight new titles that begin with "A" ). She has had three incisions in her abdomen in the last year so while she is hospitalized she does "light" reading - books she can hold up easily and which do not weigh heavily on her stomach. She likes Patricia Wentworth, has about 50 of them. She has received fan letters from the states, Australia, Sri Lanka, Japan. She has a bibliography of all the stories alphabetically by title, chronologically, and by magazines. She would welcome any positive thoughts directed her way. "I first read Anne of Green Gables when I was eleven, and I have been re-reading it and L.M. Montgomery's other novels and short stories regularly ever since. Most people read Anne, then perhaps a few other of her novels, and go on to other things (not, of course, real Montgomery fans). But no matter what else I read, I was always re-reading some Montgomery novel or other. As a teen-age reader in the '50s I also knew Chronicles of Avonlea and Further Chronicles of Avonlea, and I was delighted when The Road to Yesterday and The Doctor's Sweetheart came out in the '70s. Forty-eight Montgomery short-stories, all very satisfying. But I was always wishing there was more. When you really love an author's work, you want more and more. So you can imagine how delighted I was in 1977, when visiting Montgomery's birthplace in Clifton Corner, P.E.I., to discover a treasure trove: twelve scrapbooks into which she had pasted 360 of her published stories. I discovered later that she had written over 500 stories … not to mention over 500 poems … and, when compiling a bibliography of these stories, I found about 50 more. So, I have a collection of 400 of her 500 stories, and since 1988, have edited seven volumes of these tales. With the publication of Christmas With Anne and Other Holiday Tales, there are 190 more Montgomery short stories in print. I hope eventually to publish them all. I first heard of Rea Wilmshurst when I ordered a copy of Lucy Maud Montgomery: A Preliminary Bibliography at the start of my LMM book collecting days in the early 1990s. Before the bibliography was printed in 1986, Wilmshurst contributed articles to Canadian Children's Literature, such as "L.M. Montgomery's Short Stories: A Preliminary Bibliography" in 1983. In 1989, ﻿CCL ﻿also printed "L.M. Montgomery's use of quotations and allusions in the Anne books". A note in this article said that a reader could contact the author and buy a copy of her index of quotations from the rest of novels as well. I wrote to Rea in 1994 to request the index and she sent me "copy #6 of 10 printed in November 1990." I treasure it very much as a resource and tribute to her diligence, passion and intellect. I bought all her short stories collections as soon as each one was published and wrote to tell her how much I loved them (at this time, I don't know of any plans to continue the series). We exchanged two notes in the spring and summer of 1994. She was terribly disappointed to have missed the announcement of the first LMM symposium at UPEI -- she had made plans to travel to Europe and could not attend. In July 1995, she wrote a few brief words from her summer cottage about the new Anne Christmas book she had compiled and her six month complete and unexpected occupation with cancer. In November 1995, I contacted Rea to do an interview about her new collection of Christmas stories for our holiday meeting of The L.M. Montgomery Literary Society. When I called, she was in the hospital and we had a marvelous talk. She was extremely pleased to have been invited by Kathy Gastle to present at the Norval, Ontario Christmas celebration and autograph her new book (it was the first time she had been asked to do a signing, I believe she said)! Her illness prevented her from attending, but she reveled in the honor and did sign books in the hospital. Here is my request: give Rea a thought or two when you can and, if you have enjoyed the story collections she has brought to us in the last seven years, e-mail a response or words of encouragement for her in care of me. I will print it and put what I get in a basket (like "Aunt Cyrilla's Christmas Basket") and mail it to her next week." We both want to thank you a million times for presenting us so many of Lucy Maud's lovely works. You are our Santa Claus, giving us warm feelings all year around. We hope for your quick recovery, and hope see you next June at the LMM conference on PEI. Thanks to you and your hard work I (and thousands of others) have been exposed to more of LMM's eloquent writing and wonderful characters. I, personally LOVE the compilations because they feed my hunger for more adventures and characters to love/hate. I send you my best wishes for peace and a very speedy recovery. I first read Maud's books when I was a pre-teen and young teen - in the late forties and early fifties. I remember feeling a great sadness when they came to an end - or so I thought - and there were no more of her books to which I could look forward. It was a real delight to discover the short stories, and to realize that, thanks to you, there was still more Maud to read. I've asked a friend to e-mail my overwhelmed gratitude to you. We got your package yesterday (I regret to say the ball had come apart) and I simply wept over all the messages you had so carefully printed out for me on such excitingly coloured pages. … I do truly appreciate it and thank you from the bottom of my heart. Can you circulate somehow to all the people who wrote my joy and uplift at receiving their messages. And assure everyone that the project will continue. I have chosen my successor, and she will keep the series going as long as the publisher will. Your many messages will help convince the publisher (if they need convincing) to keep on. Medically--I am at home, kept comfortable with a permanent morphine drip (portable), and feeling fine for the moment. No predictions have been made; no one really knows how fast or slowly things will progress. Having so many unknown friends' wishes with me will surely keep the road easy. Rea Wilmshurst couldn't believe her eyes. Stuffed into a cardboard box, surrounded by pellets of mouse poison, were scrapbooks jammed with stories and poems written by her childhood idol Lucy Maud Montgomery. And Ms Wilmshurst, who thought she'd read every word written by Montgomery, the creator of the immortal Anne of Green Gables and Canada's most famous author, didn't recognize a single piece. "She was fascinated," said longtime companion B. Anderson Silber, an associate professor of English at the University of Toronto's Victoria College, who was with her when she made the discovery in 1977 while visiting Montgomery's birthplace, New London, P.E.I. Ms Wilmshurst, who delighted Montgomery fans worldwide by editing the treasure trove and publishing it in eight new collections, died of ovarian cancer Friday, March 22, 1996, in the Salvation Army's Grace Hospital in Toronto after a lengthy illness. She was 54. Born in Toronto, Ms Wilmshurst worked for a decade as a Bell Canada service representative before returning to school and graduating from the U of T in 1971, with a degree in English. After teaching French in several public schools in Newmarket, she returned to Toronto and worked as a freelance academic typist. The bulk of her work was as an editorial assistant on two massive projects that produced, for the University of Toronto Press, the 33-volume Collected Works of J.S. Mill, a 19th-century political philosopher; and, for Princeton University Press, a collection of the works of poet and thinker Samuel Taylor Coleridge. After her discovery of the Montgomery scrapbooks, Ms Wilmshurst spent years tracking down the newspapers, magazines and other periodicals which had published - and then forgotten about - the short stories and poems. And beginning in 1988 she published, under the McClelland and Stewart imprint, eight volumes of the collection. After they began appearing, Ms Wilmshurst "heard from Anne fans around the world," Silber said. "Entire fan clubs from Japan, Sri Lanka, Denmark, New Zealand wrote to thank her for uncovering a treasure trove."